No way she doesn't chop its top off when drawing her giant samurai swords. No way. It has an enormous flowing red ribbon topknot. On a helmet. Not actual hair coming out of her head, this is faux hair in a faux pony-tail, clocking in at a good ten feet in length. Maybe she was an Olympic ribbon-dancer at some point and couldn't let go of the glory days, I don't know, but five'll get you ten at some point it chokes her to death. At least the guy behind her recognizes the danger, since he's apparently blowing it apart with his frantic gunfire. It makes her look like an "Aliens" love child. Her eyes have been squashed way out to the side where no actual human eyes would ever be naturally, and her nose has been completely crushed. Now that's being a slave to fashion, folks. Of course you also have the obligatory thigh-purse full of completely-inaccessible pouches of whatever and the incredibly flexible armor with full-on ankle joints that have hinges for no reason, since they don't actually connect to footwear. So you can forgive Lethal if she appears a bit cranky; you would be too if your face were being crushed and eaten by your helmet. She's not the first woman to suffer for fashion, and thanks to her handy-dandy swords, she won't be the last. About the only positive thing I can say about the costume is that “it covers everything, and conceals absolutely nothing”. Unlike the usual “three stamps and dental floss”. Wow. In the words of Simon…That is absolutely dreadful. Hmmm. In that last panel, that leg does go all the way up. 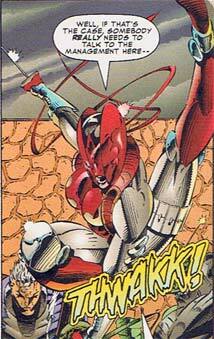 Should we assume that all Liefeld characters have stretchable limbs like Dhalsim from Street Fighter? It’s the only way to explain Lethal’s leg as Frankie pointed out, as well as the other contortionist poses his other characters make. Choke is unlikely. In this case, unless either she or that armor has a superstrong neck, I’d say there’s a good chance hers is going to be snapped by an opponent someday – assuming it takes an actual opponent, and not a piece of background that thing got wrapped around. Are breast implants mandatory for female comic characters? Having spent my childhood doing gymnastics and martial arts, to me the women possessing the level of fitness and flexibility required to do the kinds of things required by the action heroes of comic books were all commonly characterisaed by a distinct LACK of breasts as a result of the increased testosterone levels in their system brought about by such intense training throughout puberty. So is there a surgery out there offering perfectly spherical implants for women in the workforce of espionage, action and murder? I would have to say that there must be, and that he is a surgeon who had never actually seen a real pair of breasts of how they sit on a women’s body. There’s an idea fo a comic right there. Yes it is a separate branch of the FBI that keeps the same initials. They stand for Female Breast Insertions. It is mainly made up of 40 year old computer geeks and 12 year old boys. Oy, the headaches she must get! The thing looks like it weighs at least 25 pounds. 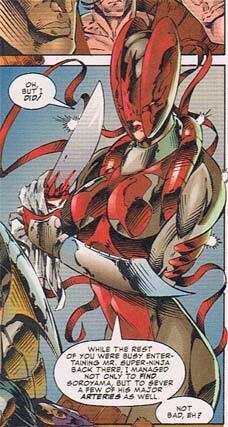 This character’s a ninja-type acrobat, too, which makes the helmet even weirder. How can you jump around with that thing on your head? The desing is, in my observation, a big ‘sour grapes’ to Marvel for keeping Liefeld’s DEADPOOL character and likeness. It’s Deadpool’s outfit – exaggeratedecch. The same thing happens again in a comic I saw in the bargain bin titled, ‘Blacklash’. This time, the copycharacter is a dude that has more muscles than twelve Hulks put together in the same bodyframe, yet manages that trademark kick/pose (third panel JH has up there). It happens AGAIN in another book by Liefeld bro Dan Fraga, except the Deadpool copycharacter concept here is that the costume is blue, and the dude has – cat ears and a tail. Doing that same kick/pose. Ha! Well crafted, Jeffrey. Well crafted indeed!